My Chicken Bacon Ranch Casserole is a hit with kids and adults. Quick, easy, and so comforting. This is cheesy, bacony, and filling. 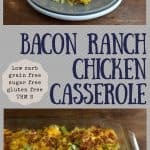 This Bacon Ranch Chicken Casserole is one of my favorite low carb chicken recipes ever. Mondays can be tough. Especially when the toddler wakes up every hour all night long the night before and won’t go back to sleep. Again and again. So… With that said it is a “Drive Through Sue” kind of day. Thank the Lord I already had cooked chicken in the fridge so I was able to quickly whip up a casserole that I could pop into the oven for dinner. If you’ve read any of the Trim Healthy Mama books you know the phrase “Drive Through Sue”. If you haven’t it is a name for those of us who like to make things quick and easy and don’t mind using shortcuts (like prepared sauces instead of making our own even if homemade would be a bit healthier). I do enjoy cooking and baking or I wouldn’t have begun this blog but there are days I just need a break. I knew by the time 5 o’clock came around I would be wiped and barely able to drag myself off the couch let alone make a nutritious dinner. 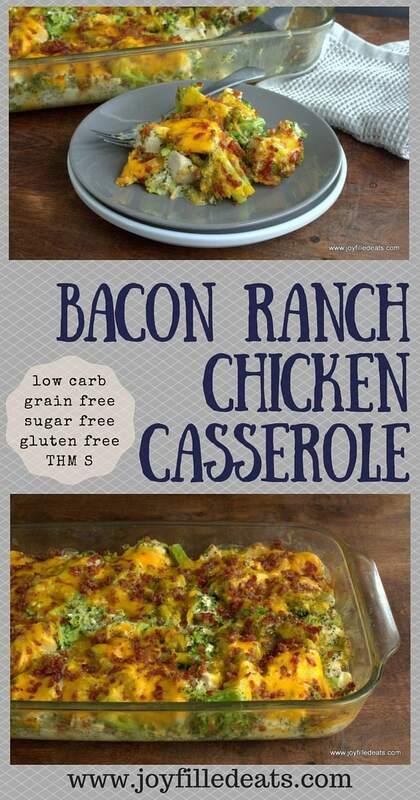 This easy Bacon Ranch Chicken Casserole recipe was really good. Most of us gobbled it up and had seconds (the 4 yo has a limited acceptable food list and casseroles are not on it). However, the first grader claimed a thermos of the leftovers for lunch tomorrow. That makes mommy happy. Anytime you need low carb chicken recipes just come here. We eat SO much I am constantly trying to find new and exciting ways to use it. I think I love chicken casserole recipes the most! Check out how easy this family-friendly chicken casserole recipe really is! 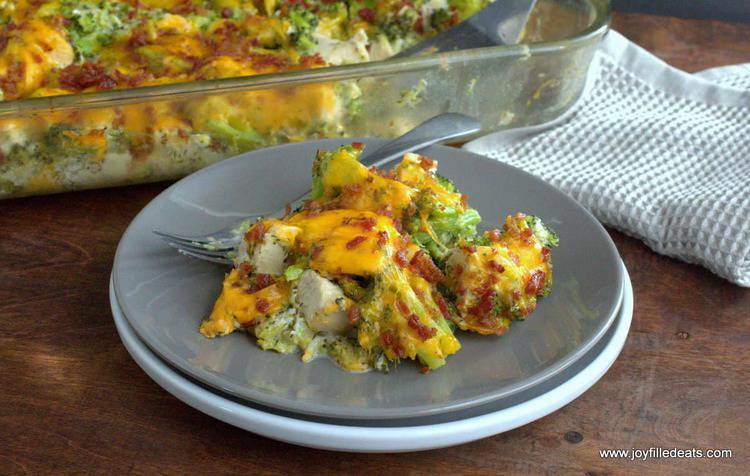 This easy casserole has chicken, broccoli, bacon, and cheddar in a creamy homemade ranch sauce. It is low carb, keto, gluten-free and kid approved! Your whole family will love it. Preheat oven to 350 if baking immediately. Or you can prep ahead and keep in the refrigerator for a day or two. 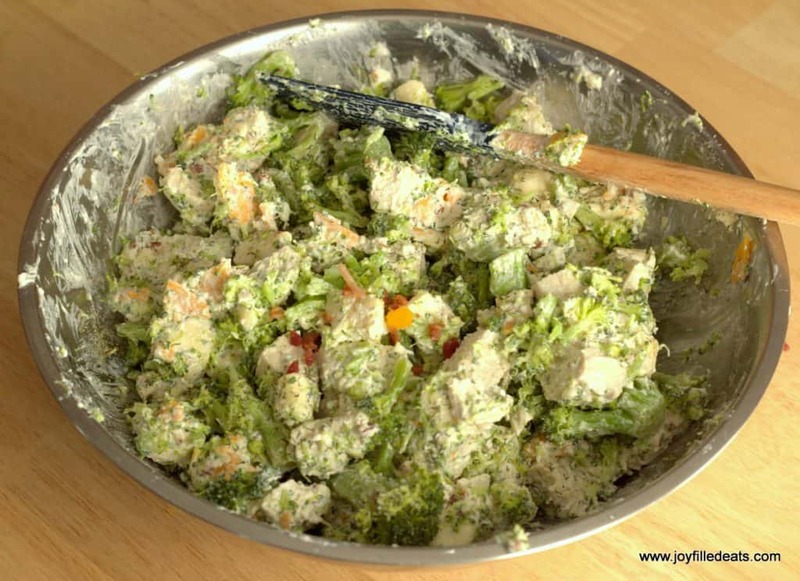 In a big bowl combine cream cheese, sour cream, mayo, and spices and mix thoroughly. To the cream cheese mixture, you just made add the chicken, broccoli, 3/4 of the cheese, and the 1/4 cup bacon crumbles and mix well. Dump into a 9x13 baking dish sprayed with cooking spray. Sprinkle remaining cheese and 2 tbsp bacon crumbles on top. Bake until hot about 35 minutes. My unique blend of spices is what gives this the ranch flavor. You do not need a packet of ranch mix or bottled ranch dressing. These spices and herbs also work well to make homemade ranch dressing or dip! Just mix them with sour cream and mayo for a dip. For dressing thin with a little almond milk. Only 5 stars?? I want to give you 10!! I've made this several times, used cauliflower, leftover chicken&gouda sausages.. You can mix it up! A mainstay in our home. Thank you! I'm recently diagnosed with type 2 diabetes so had to make a huge lifestyle change! Finding recipes that my husband will also enjoy has been a challenge, he's pretty picky! But, this little gem right here was an absolute winner! SO good and I will absolutely be making this again! As a ranch lover, this meal is so good. My wife loves when I make this casserole! It makes for great leftovers for lunch too. I just divide the remaining in Tupperware so we both have lunch for the next day or two. Do you use store bought bacon crumbles? Yup! I buy them at costco or walmart. They are real bacon. We add riced cauliflower to this to make it go a little farther and it's delicious! A favorite variation is leaving out the bacon and adding Franks Red Hot sauce for a buffalo ranch twist. Out entire family, kids included, love both variations. WE LOVE THIS DISH!! 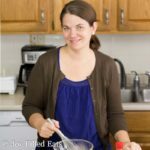 I make it all the time - I'm keto, my husband isn't - it's his favorite thing I make! I usually double it because he likes it so much. I have experimented and added different veggies in with the broccoli - spinach, carrots, cauliflower, mushrooms - so far all have been great! I also add fresh chopped garlic and it brings the garlic flavor up a bit and it's really tasty. I’ve made this several times. It’s easy to make, comes together fast and is delucious. I’m having it again tonight. Thank you for sharing the recipe! I make this for my family all the time and it is most definitely a favorite!! I want to make it for a friend who just had her 5th baby! I'd like to get most of it done ahead of time the night before. Do you suggest putting it in the fridge overnight and baking the next day or freezing it the night before? Or should I just bake it the night before and freeze overnight? Thanks!! You can prep and refrigerate overnight. Hello love this dish thanks so much for sharing. However, I would like to know about the serving size. You said 8 servings but how much is that a cup? 2 cups. Please be more specific! Thank you! I'm sorry but I didn't measure it by cups. If you cut through the cheese you can see the 8 servings. So it doesn’t need to be covered when cooked? Just made this tonight and everyone loved it!!! Great Recipe!! What else can I use instead of the mayo? If you just don't like mayo I want to assure you that you cannot taste it in this recipe. If you just don't want to use it you can use all sour cream. Cook the chicken first. Using raw chicken makes the sauce too thin. The chicken releases natural juices. And the chicken isn’t overcooked? How do you prepare your cooked chicken (baked, boiled)? Would a roast chicken work? Also are you using fresh dill or dried? The chicken isn't overcooked. Most casseroles call for cooked chicken. I normally bake my chicken covered just until it reaches about 158-159 degrees. It should go up to 160 when resting. I use dried dill but fresh works too. Thank you for sharing your wonderful recipes. Our family and friends are enjoying these delicious dishes! 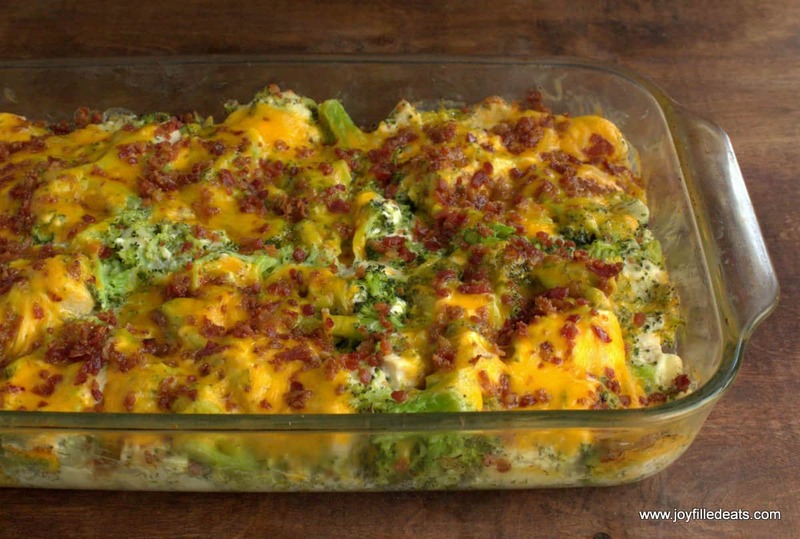 I’ve made this cheesy chicken bacon broccoli bake several times, and find that I like adding the broccoli about 10 minutes into the baking time. This gives the bacon a little time to cook and get crispier edges. Then I throw the broccoli on top and cover with shredded cheese. Can I make this to freeze? Yes. I have frozen it successfully after baking it. I freeze it in lunch sized portions and then just microwave to heat them. It would probably work to freeze before baking too but I haven't tested it yet. Hello, Can't wait to try the recipe! One question, what the serving size portion? This has 8 servings. I normally just eye it up when scooping into the plates. I get asked for this recipe all the time. I have it bookmarked for easy sharing. I think the biggest bonus is that my kids love it!!! And also it's fairly easy to make. Just made this, it was so good, thanks! I forgot to put the mayonnaise, but it was still delicious. Hope to try your other recipes. Why is it called Ranch if there's no ranch dressing in the recipe? Because it tastes like ranch. You don't need bottled ranch dressing for a ranch flavor. You just need the right blend of spices. I had about 4 oz leftover rotisserie chicken so I eyeballed the rest of the ingredients and made this into a single serve microwaved dish for myself. It was fantastic! Thanks! Could you make this in a crockpot and for how long? I made this a few days ago and loved it. 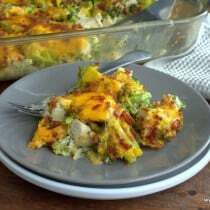 But I want to make it again and add cauli-rice, so it's more like a broccoli rice with chicken casserole. Would I cook the rice before adding it to the mixture and putting in the oven? Would I need to up the cream cheese and sour cream to accommodate for the added vegetables? Any suggestions? Thanks! If you are using frozen cauliflower rice just thaw it and drain it. I think it would also work to mix in fresh but the liquid released might thin the sauce.